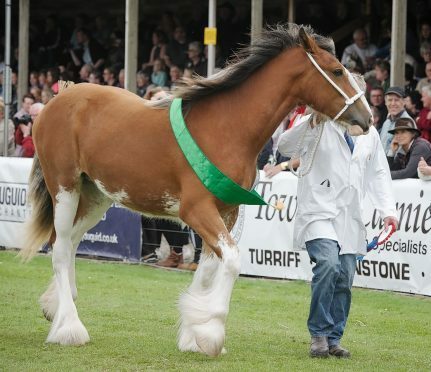 Glorious sun shone down on the Turriff Show as the coveted show champion of champions title was awarded to a yearling Clydesdale filly from Buckie breeder Ian Young. Mr Young, who runs the Arradoul stud at Wellheads, Clochan, clinched the title for the first time with his home-bred filly named Arradoul Ceilidh which stood Clydesdale and overall horse champion earlier in the day. This one, which is by Redcastle Brelee Majestic and out of Arradoul Symphony, has had a successful season on the showing circuit winning native horse champion at both Echt and New Deer. She took the top title after beating a line-up of beasts comprising the beef, sheep and dairy interbreed champions. In the beef section, the champion rosettes were awarded to John and Raymond Irvine’s December-2013 born Charolais bull Kilbline 1 Instigator. The father and son duo, who hail from Inverlochy, Tomintoul, bought the bull in Ireland last year for 7,000 euros. 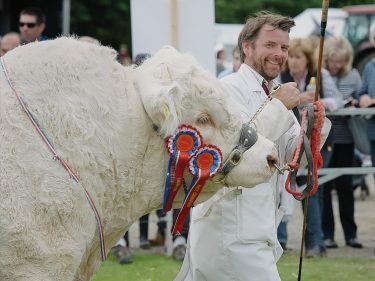 By Oscar and out of Kilbline Ursula, he was male Charolais champion and part of the champion interbreed pairs at the Highland Show. 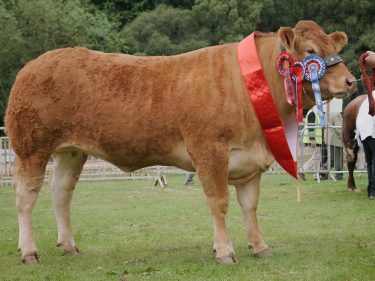 Standing reserve beef interbreed was two-year-old Limousin heifer Goldies Inchantress from Aileen Ritchie, of Tamala, Burnside, Whitecairns. This Keprico Germander daughter, out of Goldies Etoile, was bought at the Red Ladies Sale in December for 8,000gn. She was interbreed champion at Angus, breed champion at New Deer and Fettercairn and reserve at Banchory. In the sheep lines, the top title went to a home-bred Texel gimmer from Willie Knox and his sons, Graeme and Andrew, from Mid Haddo, Fyvie. This daughter of the 5,000gn Cowal Vogue, which has bred sons up to 24,000gn, is out of Strathbogie Smokey Blue. She was interbreed champion at New Deer last month and breed champion at Turriff last year. 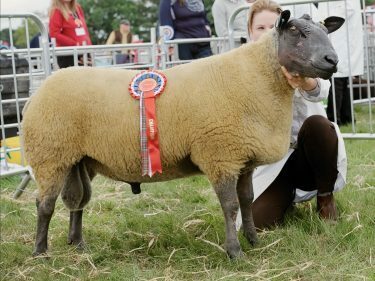 Reserve in the sheep section was the Blackface champion from Charlie McIntyre and Gemma McIntosh, of Upper Croft Na Garn, Boat of Garten. Their Gosland-bred shearling tup is by a £20,000 Allanfauld and out of a ewe by a £9,000 Auldhouseburn. He is destined for the Dingwall show and sale of Blackie rams in October. Lastly, in the dairy section the champion rosettes went to a home-bred Holstein cow – Deveronside Man-O-Man – from the Mair family at Kinnermit, Turriff. Shorthorn: Glenrinnes Farms Ltd, Estate Office, Glenrinnes Lodge, Dufftown, with five-year-old bull Chapelton Ensign, by Kavans Yankee and out of Chapelton Sister. He stood champion at the Highland. Reserve – Smallburn Farms, Plewlands, Duffus, Elgin, with six-year-old cow Lowther Sally, by Blelack Minstrel and out of Lowther Sally 1. She was bought as an in-calf heifer and has had five calves. She stood champion at Turriff two years ago. Aberdeen-Angus: Neil Wattie, Mains of Tonley, Alford, with March-2015 born bull Tonley Elgar, which is the first son of the 9,000gn Warrenhoe Empreror and out of Tonley Emilie. He stood reserve at Banchory and Echt. Reserve – Neil Wattie with February-2015 born home-bred heifer Tonley Ester, by Blelack Evor. She stood reserve female at Echt. Charolais: John and Raymond Irvine, Inverlochy, Tomintoul, with December-2013 born bull Kilbline 1 Instigator, which was bought in Ireland last year for 7,000 euros. 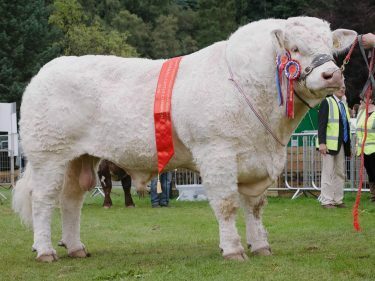 By Oscar and out of Kilbline Ursula, he was male Charolais champion and part of the champion interbreed pairs at the Highland Show. Reserve – M Bruce & Partners Ltd, of Mains of Logie, Ellon, with five-year-old bull Goldies Golddust which was bought for 8,500gn and has bred sons to 5,000gn. He is by Goldies Uppermost and out of Blelack Ripple. He stood reserve champion at New Deer. Simmental: WJ & J Green, Corskie Farm, Garmouth, Moray, with January-2015 born home-bred bull Corskie Gingersnap, by the 45,000gn Bel Dhu Capercaillie and out of Corskie Winola. 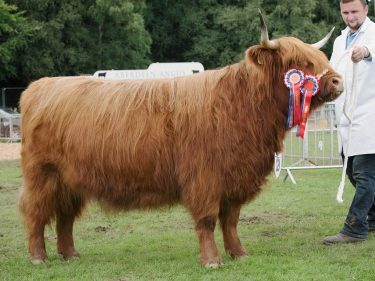 He stood champion of champions at Echt, breed champion at Nairn and New Deer and junior interbreed champion at the Highland Show. 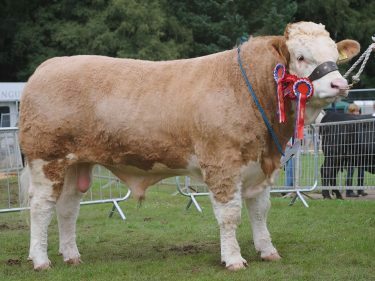 Reserve – WJ & J Green with October-2014 home-bred heifer Corskie Figen, by Bel Dhu Capercaillie and out of Corskie Bygen. She was junior female and reserve overall female in the Simmental section at the Highland. Limousin: Aileen Ritchie, of Tamala, Burnside, Whitecairns, with two-year-old heifer Goldies Inchantress, by Keprico Germander, and out of Goldies Etoile. She was bought at the Red Ladies Sale in December for 8,000gn and stood beef interbreed champion at Angus, breed champion at New Deer and Fettercairn, and reserve champion at Banchory. Reserve – Mike Massie, Mains of Elrick, Auchnagatt, Ellon, with April-2014 born home-bred bull Elrick Jethro, by Rahoney Geoffrey and out of a heifer called Elrick Fiona. He was on his first outing and will be kept as a stock bull having already run with 30 cows. Blonde: Neil and Graeme Anderson, Beltie Cottage, Glassel, Banchory, with home-bred two-year-old bull Glassel Jasper, by Strathisla Glen and out of an Ardmore cow. He stood champion at Echt and reserve at Banchory. Reserve – Alison Watt, Birkenburn, Keith, with six-year-old cow Strathisla Ellen, by Super and out of Strathisla April. She was champion at Banchory and first in her class at Echt. Highland: D & B MacNaughton, 72 Centre Street, Kelty, Fife, with three-year-old home-bred heifer Skye 4th of Rannoch, by Fergus of Isle of Bute and out of Skye 2nd of Rannoch. She was champion at Fife and reserve at Braco. Reserve – Veronica Thomson, Clackriach Cottage, Maud, with six-year-old cow Heather 8th of Tordarroch, by Craig of Tordarroch and out of HEather 11th Innisard. She was bought as a four-year-old with a calf at foot and was shown yesterday with her February-born bull calf Alasdair of Clackriach. British Blue: J K Manson, Upper Northfield, Wick, with a three-year-old in-calf female called Graymar Halle, by Empire D’Ochain and out of Graymar Electra. She stood champion at Sutherland, Caithness and Latheron. Reserve – Garry Patterson, Upper Forgie, Aultmore, Keith, with January-2015 born heifer Trencrom Kwality Street, by Boherard Cantona and out of Trencrom Ex Factor. She was bought at Carlisle in May for 3,500gn and was on her first outing. Any other breed: Ian Skea, of Coreen, Dalrich, Kemnay, with home-bred April-2015 born Hereford heifer Bennachie 1 Curly 4th, by Panmure 1 Herman and out of Bennachie 1 Curly. Reserve – Ian Skea with home-bred Hereford bull Bennachie 1 Masterman, by Panmure 1 Herman and out of Bennachie 1 Flora. Cross: Gordon Hendry, Heads of Auchinderran, Keith, with a home-bred January-born Charolais cross heifer, which stood first at Angus, Echt, New Deer and Nairn. She will be sold at the Thainstone Spectacular later this month. Reserve – Harry Brown, Auchmaliddie Mains, Maud, Peterhead, with two-year-old Limousin cross heifer Molly, which was bought in Orkney last year for £1,200. She stood reserve at Banchory and second at New Deer. Holstein: Stuart G Mair & Sons, Kinnermit, Turriff, with home-bred cow Deveronside Man-O-Man Maralyn 2, by Man-O-Man. Reserve – Jean C Baird, Mains of Culsh, New Deer, with four-year-old home-bred cow Whattonvale Burobis 47, by Whattonvale Moonraker and out of Whattonvale Burobis 37. She calved in March and is giving 47 litres a day. Dairy calf: G & A Taylor, Upper Braikley, Methlick, Ellon, with June-2015 born heifer Braiklay Sharpe Kestrel, by Tynevalley Sharpe and out of Braiklay S Pete Kestrel. Reserve – G & A Taylor with August-2015 born heifer Braiklay Goldmine Brogie 2, by Hydaways Goldmine and out of Braiklay Outside Brogie. 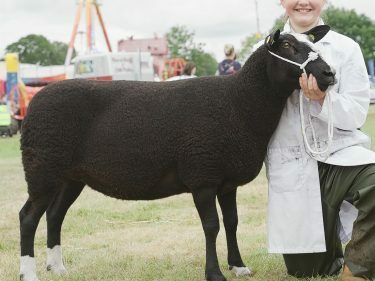 Beltex Scottish National Show: Alan Munro, The Stables, Loandhu, Fearn, Ross-shire, with a tup lamb by Airyolland Wurzel. 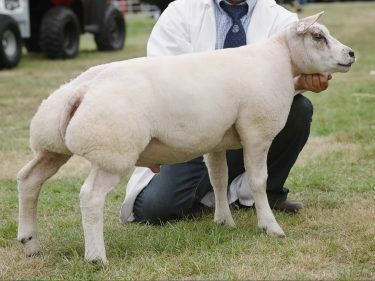 Reserve – Richard Wood, Kingledores Farm, Tweedsmuir, Biggar, with a ewe lamb called Kinglesdores Betty Boo, by Clary Ablaze and out of Kinlesdores Starlight. She was second at the Highland and Biggar. Suffolk:Jim Innes, Dunscroft, Huntly, with a ewe lamb by a One Direction sire and by a Milnbank ewe bought at Robbie Wilson’s dispersal. She was on her first outing. Reserve – W.G. Troup, Corrennie House, Shaggart Farm, Sauchen, Inverurie, with a tup called Rhaeadr High Roller, by Rhaeadr McCoy and bought at Stirling last year for 4.200gn. He was reserve champion at the Highland. Bluefaced Leicester: M Seed & Son, Home Farm, Auchry Road, Cuminestown, Turriff, with a ewe lamb bought at Builth Wells for 3,600gn. 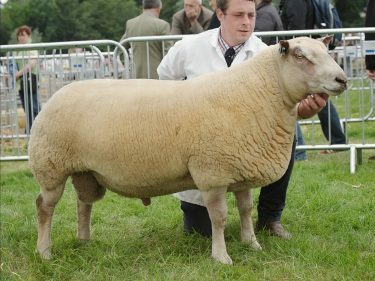 She is by Myfyrian H1 and out of a home-bred ewe by Cassington D1 which stood champion at Turriff last year. Reserve – Gordon U Mackenzie, Broomhill Farm, Muir of Ord, Ross-shire, with a gimmer by a Mendick sire and out of a Rossybank ewe. She was on her first outing. Texel: W J Knox, Mid Haddo, Fyvie, Turriff, with a home-bred gimmer by the 5,000gn Cowal Vogue, which has bred sons up to 24,000gn, and out of Strathbogie Smokey Blue. She stood interbreed champion at New Deer and breed champion at Turriff last year. Reserve – Jim Innes, Dunscroft, Huntly, with a tup lamb by the 14,000gn Millar’s Windbrook and out of Glenside Razzle Dazzle. Charollais: Willie and Carole Ingram, Logie Durno, Pitcaple, with Rhaeadr Orlando, a two-shear ram bought at Worcester for 5,000gn. 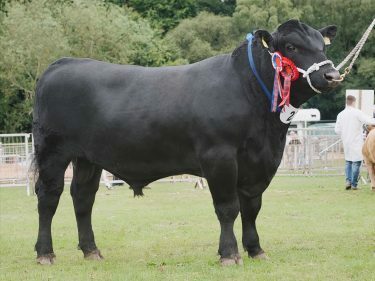 Sired by Warnfawr Neo, he was champion at the Highland and Angus, and reserve male at the Royal Welsh. Reserve – Gregor and Bruce Ingram, Logie Durno, with a ewe by Riverdale Noble and out of Southam Ice Maiden. She stood third at the Royal Welsh. Zwartbles: Faye Wilkie, Whitestone Farm, Skene, Westhill, Aberdeen, with a two-year-old ewe called Broomfield Beyonce, by Elidon Hill Am Yer Man. She was bought in Carlisle for 2,000gn last year when she stood female champion. 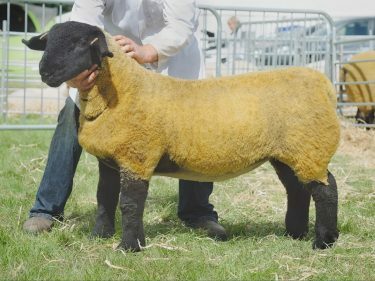 Reserve – David and William Moir, Home Farm, Cairness, Fraserburgh, with a tup lamb called Cairness Director, by Homely Cammanche and out of Cairness Barbie Girl. He was reserve overall at the Zwartbles national show in Turriff last year and will be sold in Carlisle on Friday. 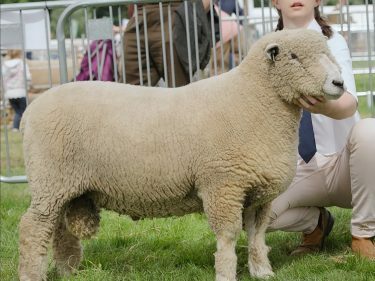 Any other breed accredited: W & N Lawrence, Blackpots Farm, Auchnagatt, Ellon, with a Lleyn gimmer by a John Morton tup and out of a home-bred ewe. Reserve – Thomas Jackson, Boghead, Lumsden, Huntly, with a Lleyn shearling tup by Emirates Jones and out of a home-bred ewe. Any other breed non-accredited: W & J Brown, Hilton of Culsh, New Deer, with an Oxford Down tup lamb by a Duntarvie sire and out of a home-bred ewe. 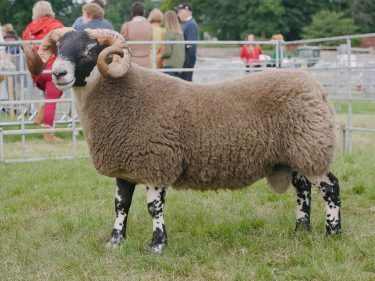 Reserve – Grant & Wright, Inner Gellie House, Anstruther, with a Cheviot ewe. Blackface: Charlie McIntyre and Gemma McIntosh, Upper Croft Na Garn, Boat of Garten, with a Gosland-bred shearling tup by a £20,000 Allanfauld and out of a ewe by a £9,000 Auldhouseburn. He will be sold at Dingwall in October. Reserve – Euan Rogerson, Peterhead, with a tup lamb by an £8,000 Nunnerie son and out of a £1,800 Dalwyn. Ryeland: Raymond Aitken, Beech Cottage, Newton of Fetternear, Inverurie, with a shearling tup by Fetternear Tickety Boo and out of a home-bred ewe. He stood reserve male champion at the Highland. 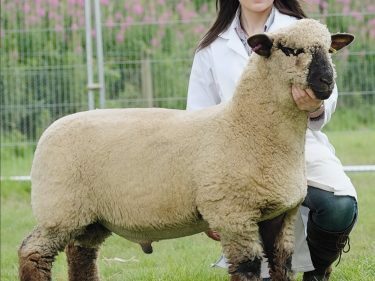 Reserve – Diana Milligan, Hill of Dess Farm, Kincardine O’Neil, Aboyne, with a gimmer by Broomwell Super Mario and out of Trooper Wilma. She was on her first outing. Bleu Du Maine: Rachel Cruden, 2 Standingstones Cottages, Dyce, Aberdeen, with an aged tup. 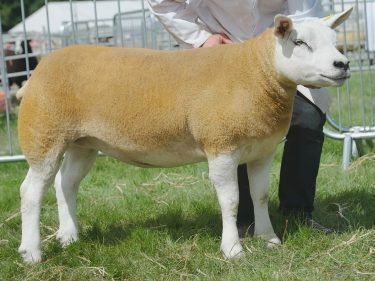 Reserve – Peter Fraser, Tighnahinch Farm, Alcaig, Dingwall, with a gimmer by Maximum Lawman and out of a home-bred ewe. She is heading to Carlisle for the breed society sale. Small and horned minority breed:Neil and Zoe Robson, Loanhead Croft, Cairnie, Huntly, with a one-crop Portland ewe, with Hawes Farm breeding and bought in Cumbria. Reserve – Neil and Zoe Robson with a Portland tup lamb by Sutton Roger and out of Loanhead Rihanna. Cross: W & J Brown with a pen of three home-bred Texel cross gimmers. Reserve – Messrs Sutherland, Sibmister Farm, Thurso, with a Texel cross ewe and a pair of lambs. 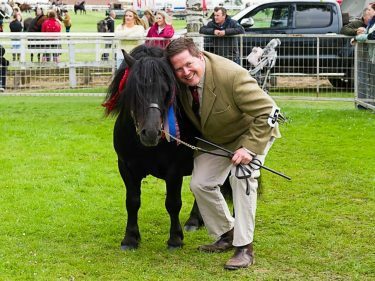 Clydesdale: Ian Young, Wellheads, Clochan, Buckie, with home-bred yearling filly Arradoul Ceilidh, by Redcastle Brelee Majestic and out of Arradoul Symphony. She was native horse champion at Echt and New Deer. Reserve – Norman Christie, Roadside, Fintry, with seven-year-old yeld mare Anguston Amber, which is by Greenlass Lochy and out of Anguston Amy. She stood champion at Banchory and reserve at New Deer, Echt and Fettercairn. Highland: Priscilla Crockett, Crannoch Hotel, 12 Blantyre Street, Cullen, five-year-old mare Cairns Jude, by Donald of Shielhill and out of Naomi of Forglen. Reserve – Christine Gunn, Upper Haugh Croft, Alford, with 10-year-old mare Murraypark Saffron, by Strathnaver of Osclay and out of Coulmore Sprite. Shetland (standard): HP Sleigh and Sons, of St Johns Wells, Fyvie, Turriff, with 10-year-old stallion Westpark Royal Star, by Westpark Rising Star and out of Westpark Emerald. He was reserve champion at Turriff, champion at the Highland, reserve at Fife and overall horse at New Deer last year. Reserve – HP Sleigh and Sons with 16-year-old mare Kerlock Evita, by Stow Review and out of Westpark Elmareen. She was shown with her filly foal at foot, which place second, and she stood champion at Banchory on her last outing in 2013. Shetland (miniature): Ann Irvine, Kininvie, Blackford, Rothienorman, Inverurie, with six-year-old stallion Rocky of Haybrake, by Hazelhead Dynamite and out of Erica of Haybrake. He was champion at Banchory on Saturday. Reserve – Reece Macleod, Lochfleet, Dornoch, Sutherland, with six-year-old yeld mare Hjaltland Hirta, by Vallendale Geordie and out of Fenella of Houlland. She was champion at Grantown and Strathbogie last year.